Nora Barnacle was James Joyce’s wife and inspired many of his works. TUCKED AWAY ON the quiet road of Bowling Green, Galway, adjacent to the River Corrib, sits The Nora Barnacle House. The smallest house on the street, it has an electric blue front door, two white windows and an oval plaque stating its significance. Without this plaque, the house would look just like any other on the road. Nora Barnacle, if you don’t know, was the wife and muse of acclaimed Irish writer James Joyce. She lived in this house with her mother and six siblings until 1904, when Nora left Galway for Dublin, where she met Joyce. Built in the 1800s, the house consisted of just two rooms and a tiny back garden. The ground floor served as a kitchen, dining room and often a bedroom, while the upstairs room was a communal bedroom. Brian Nolan of Galway Walks, Walking Tours of Galway, told TheJournal.ie: “Bowling Green is a lovely terraced enclave of tiny artisan houses at the back of what was the military barracks. Either side, the street was surrounded by abattoirs. Months after meeting, Nora and Joyce moved to Europe, with Nora giving birth to their son Georgio in 1905. In 1907, Joyce and Nora welcomed a daughter, Lucia. Two years later, Joyce first met his mother-in-law Annie Barnacle in the house when he and Georgio visited, reports IrishTourist.com. The family-of-four returned to Number 4 in 1912 for a three-week holiday, spending most of it at the house. Nora, accompanied by her two children, visited the house again in 1922. Her mother lived there until she died in 1940. From then, the house stayed derelict until the 1980s when it was purchased and restored to its earlier condition, with the address changing to 8 Bowling Green. Under its new ownership, the house opened as a museum, with souvenirs, photographs and letters related to the family on display, attracting crowds of Joyce enthusiasts. Nowadays, the museum is closed – although a hand-written sign on the downstairs window says it’s ‘open occasionally’ and lists a phone number to contact. Nolan told TheJournal.ie that his last booked tour there was three years ago: “It was a wonderful experience, albeit in a tiny space. While the museum is now essentially closed and sits surrounded by modern-day restaurants, shops, bars and amenities, The Nora Barnacle House holds its status as an important piece of Irish history that remains untouched. 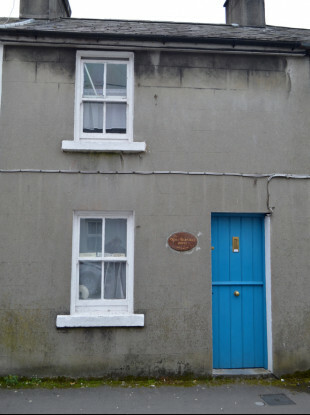 Email “Double Take: The humble Galway house that played a part in Irish literary history”. Feedback on “Double Take: The humble Galway house that played a part in Irish literary history”.